Afghan President Hamid Karzai has demanded that all detainees being held by British forces in the restive south be handed over within two weeks, saying that holding prisoners any longer would be a violation of sovereignty. "Any continuation in detention of these prisoners by British forces will be a violation of Afghanistan's national sovereignty and laws," Aimal Faizi, Karzai's spokesman, said in a statement released late Saturday. Faizi said that a June 22 deadline for the handover had been set and that the British embassy in Kabul had been informed. Karzai has made the issue of Afghans held by foreign forces a symbol of national independence before he steps down next year and as US-led combat troops wind down more than a decade of war. The United States handed over full control of Bagram prison in March after months of lobbying from Karzai. 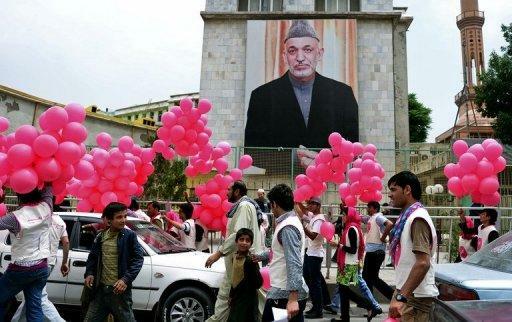 Volunteers walk past a poster of Afghan President Hamid Karzai as they distribute balloons as part of an art project promoting peace, in Kabul, on May 25, 2013. Karzai has demanded that all detainees being held by British forces in the restive south be handed over within two weeks, saying that holding prisoners any longer would be a violation of sovereignty.